Many years ago, in June of 2007 in fact, we visited the Jello Museum in LeRoy, New York, on our way to the Fingerlakes District, where we were celebrating the 50th anniversary of our friends Shirley and Joe. I never knew there was a whole museum dedicated to Jello and when I read about it in the guide book, I knew we had to visit it. To get to the Jello Museum, which is the backside of a big house, you follow the "Jello Brick Road" (right away that appealed to me). When you get to the small museum, the woman who sells you your ticket then closes the counter ('cause you are probably the only people there) to give you a mini guide of the place, which, as I recall, is about 4 rooms in size, and then leaves you to explore the displays and sit in the video room to watch a history of Jello TV commercials (I didn't realize Bill Cosby was the spokesperson for so long). You exit the museum through the ubiquitous gift shop where you can buy everything with the Jello logo on it. I knew I had to pick up something and so I bought myself a yellow shirt with the logo of a box of Jello on it. It is very comfortable and I have worn it a lot over the years. Every time I wear it in public, I usually get a comment from someone about it and it gives me the opportunity to publicize the Jello Museum, which nobody knows exists. Now I'm getting ready to pack for our upcoming trip and I'm trying to decide whether to bring the Jello t-shirt or not. This shirt has seen the world. 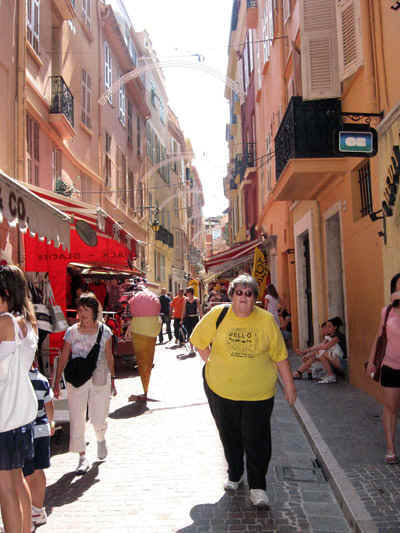 Jeri took this picture of me walking through the streets of Monaco, on my way to the palace. 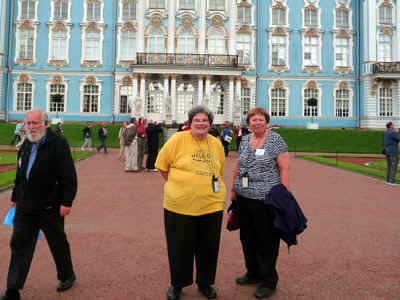 This is a picture of Char and me standing in front of the Catherine Palace in Russia. 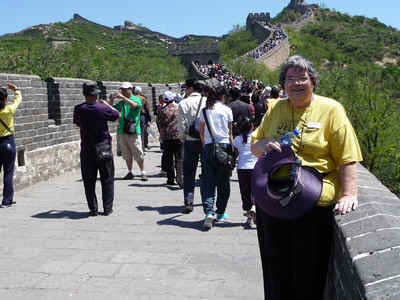 And I was wearing the Jello shirt when I climbed the Great Wall in China. When we got home from China and I looked at my pictures and realized that once again I was wearing that old Jello shirt in so many photos, I vowed that I would NOT take it with me on our next trip. But now that I'm making decisions about what to pack and what not to pack, I'm realizing that it has become kind of a tradition to wear the old Jello shirt, even though I do have more flattering (though not by much) looks. So I guess I will trot out the Jello shirt and toss it in the suitcase yet again. 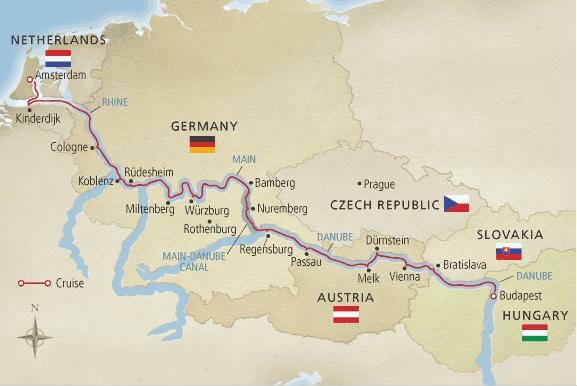 It has traveled so much, it almost needs its own passport!